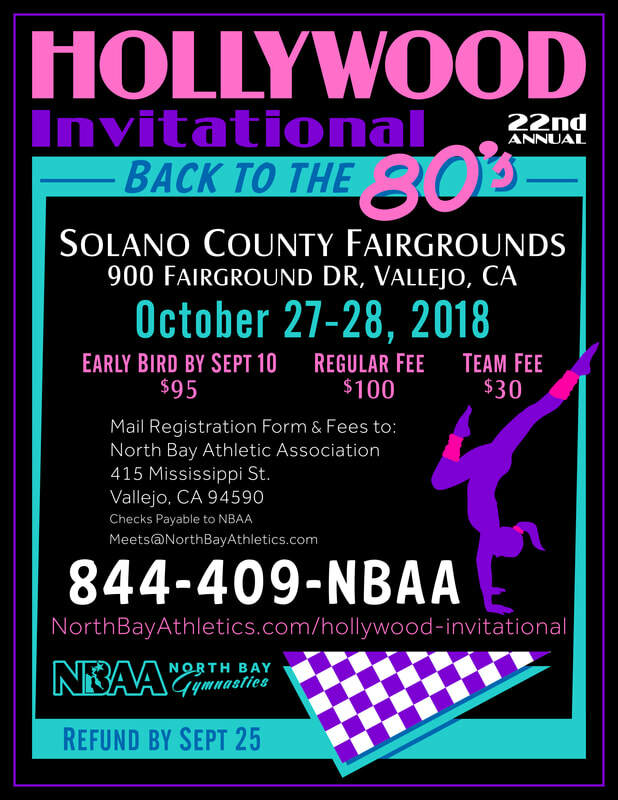 On October 27-28, 2018, North Bay Athletic Association invites all competing gyms to join as as we host our 22nd annual HOLLYWOOD INVITATIONAL. The 2018 Hollywood Invitational is open to competitive Junior Olympic levels 2-5. This off-site meet is located at McCormick Hall at the Solano County Fairgrounds at 900 Fairgrounds Drive, in Vallejo, CA, tucked in-between the Bay Area and the Napa Valley. The 2018 Hollywood Invitational is North Bay's long-standing and well-established compulsory meet for the fall compulsory season. ​Join us to enjoy high quality competition as we pay homage to Hollywood and film in this fun-filled thematic meet, including costume accessories for each gymnast at march-in, t-shirts, coaches' gifts, concessions, and high quality hospitality services for all of our visiting coaches and judges.